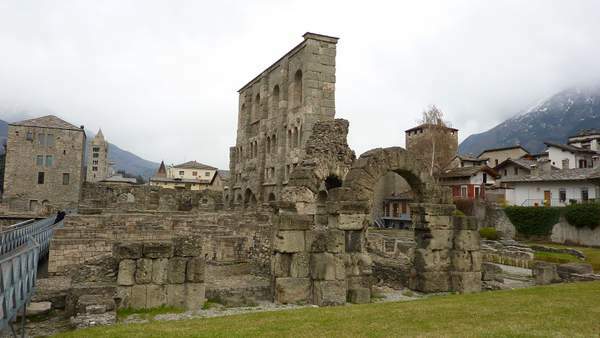 Aosta can deceive, presenting you with a significant amount of industry as you enter. But it would be a mistake to write the city off. A closer look reveals a rich history, with monuments and remains dating back to at least Roman times. 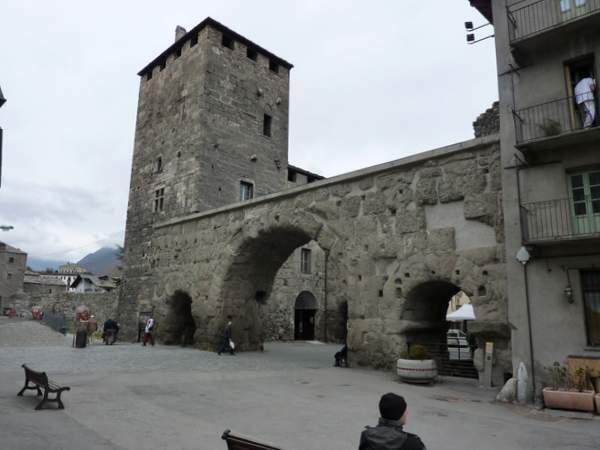 Stay and explore Aosta and you will be able to discover the Arco di Augusto; a grand arch, dating to the First Century, a Roman Gate, Roman Theatre and even the remains of a Roman Amphitheatre. Later buildings of note worth a visit, are the Collegiata dis Orso and the Cathedral. Looking at the city up close will reveal that the inscriptions on the buildings are almost all in French. This region held on to its French Provençal dialect for a long time. On my visits to the city, I’ve wandered around savouring the feeling that only being in Italy can bring. I’ve wandered around taking in buildings, doing some window shopping interspersed with real shopping before stopping at a café to enjoy a Cioccolata caldo (Italian hot chocolate) and a Tiramisu. Here I’d sit and do some people watching. 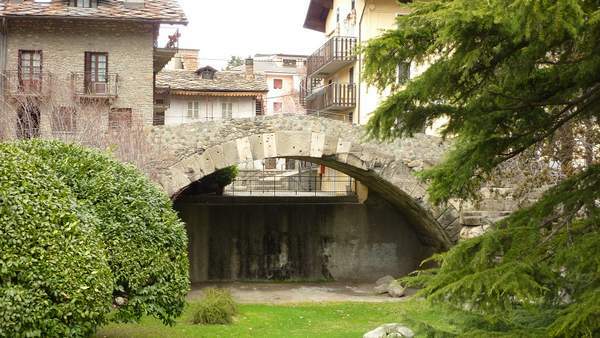 Aosta occupies an important strategic position in the Aosta Valley, with three major Alpine crossing routes passing through the city. The oldest two being the where the roads Petit (Little) Saint Bernard Pass from France and the Grand Saint Bernard Pass from the Swiss Valais. Since the 1960’s the road from the Mont Blanc Tunnel also comes down to Aosta. The valley in which Aosta is located is named after it, and so is the Region. The Aosta Valley has some highly rated ski resorts including Courmayeur and La Thuile. 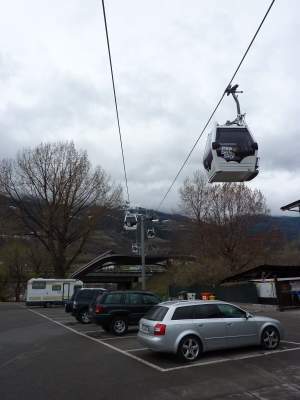 There is even a ski lift bottom station in Aosta where you can board one of the gondolas to be whisked up to the resort of Pila. If your aspirations are for a bigger resort then Cervina the resort on the Italian side of the Matterhorn is not too far away as well. The nearest railway station is Aosta. Book a rail ticket there with voyages-sncf.com. Eurolines also stop here on their Amsterdam to Milan route. Why not put Aosta in the HotelsCombined Search Engine:and search over 30 of the world’s leading hotel reservation sites at the same time. A paraglider pilot soars above the Chamonix Valley, after taking off from Planpraz, where this photo was taken. The Aiguille du Midi towers over the town on the left of the picture, while Mont Blanc is the mountain on the right. The true majesty of Mont Blanc cannot be comprehended, even from up here in the mountains opposite, but move further away to at least as far as Megeve and the summit can be seen as the tallest in the Mont Blanc Massif. 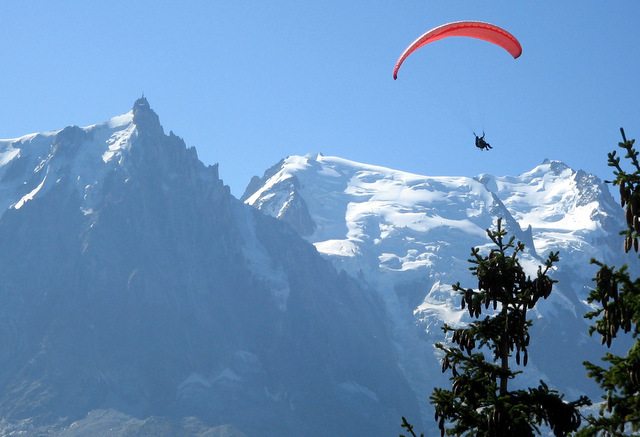 Chamonix is a popular place for paragliding. It has numerous paragliding schools where you can take a tandem flight. If you get the bug, it is possible to progress to obtaining a solo licence after one week’s continuous tuition. The photo is from August, but as long as the weather conditions are amenable, then it is possible to fly at all times of the year using the the cable cars and Europe’s highest cable car lift to the Aiguille du Midi to gain access to the take of zones. I’ve decided to call this series of posts #PhotoFlashbacks as I don’t intend to post a ‘Photo of the Day’ everyday. Furthermore, they are not Postcards from anywhere. Unless of course you are one of those people who buy postcards at a place then forget to send them and end up sending them from home. Bus to Chamonix. Book with Eurolines .